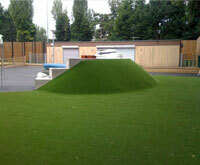 As Good As Grass specialise in supplying and installing synthetic grass and safety flooring for kids play areas. 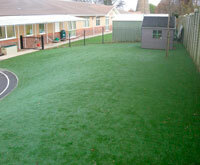 We have installed grass at many nurseries and junior schools. The most popular surfaces are soft, cushioned grasses that do not require a rubber infill. No matter what the size, we have installed grasses covering over 3000 sq metres for nurseries and schools and we have installed surfaces covering 15 sq metres for back garden home nurseries. We enjoy working alongside schools to achieve a sports lawn, distance landscaping or play area that fits within schools budget. We will work with fund raising committees, such as the PTA to install surfaces against a small deposit and await further funding to be raised. Below is a summary of recent installations; read our school case studies to get more detailed information on each school playground. 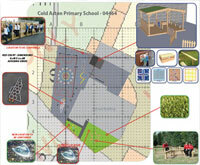 Muschamps required an interactive facility that would encourage the children to exert energy at play times. 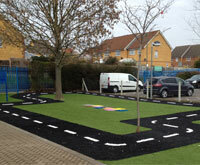 As Good As Grass created road markings in the artificial grass for fun games and road safety exercises. The variation of colour help to engage the children’s imagination. Teletubby land – A sculptured play area that enables the children to use there imagination during play. Safety flooring was required for the school playground underneath the climbing frame and play equipment. The exisiting tarmac base was considered unsafe and did not suit the surrounding area. 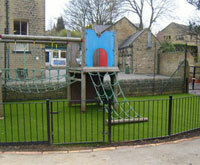 As Good As Grass were asked to provide a more suitable playground flooring solution with safety in mind. 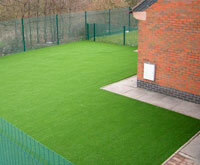 This is one of two play areas that were covered in a soft, two tone 30mm grass. 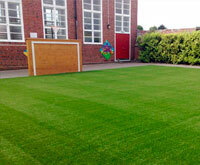 Artificial grass flooring was to be part of a major refurbishment of the school playground. The school received a site drawing from ESP (Education and Special Projects Limited) which shows how two seating areas are to be integrated with the new artificial grass. Notice how this project highlights the diverse range of applications for artificial grass flooring. The playground design includes a traversing wall, magnetic game boards and other curiousities which created a fantastically unique play area. A heavy traffic area used by children from 2 years to 8 years Old. The surface needed to be soft but durable. The teachers required small play equipment such as trikes and small wheeled buggies to pass over the surface as well as high traffic ball sports (football) to be played. The surface and sub base construction was key to achieve the necessary playing characteristics requested. Al Furqan Primary School in Birmingham needed to replace their hard tarmac area with a soft play sports area for the children. The artificial grass can improve safety with reduced impact injuries caused by a hard surface such as tarmac. It is also more aesthetically pleasing and clean with no mud or dirt. The school playground was boggy and the children could not play on it. Safety and dirt were both an issue so new outdoor flooring was urgently required. We transformed the area in 5 days over the Easter holidays and the school returned to a new child friendly playground with artificial grass. Everyone at Highfield Grange is delighted with the new outdoor all weather play area. The area around the school playground needed attention. This would allow an additional 300 sq metre’s for the children to play on. The school did not want hard landscaping as the majority of the area was on a gradient. As Good As Grass Ambassador was chosen as a perfect soft play surface. We installed this around the playground.